After encountering a technological marvel known as a Dyson Sphere, the Enterprise recovers a crashed Starfleet officer who has been in a transporter buffer for 75 years: Montgomery Scott. The episode doesn't waste any time, not even with an introductory captain's log. What Freeman Dyson was actually proposing in his 1960 paper was a series of independent satellites, not necessarily a solid shell. In fact, the solid shell form of a Dyson Sphere is the most theoretically problematic, not just in terms of how you could ever collect enough material to build one (or, indeed, how you would build it to begin with), but also in terms of how it would work. A solid shell would inevitably drift such that one side of the sphere would eventually collide with the sun; there would be no way to fake gravity throughout the interior of the sphere without increasing its mass to an even more ludicrous degree (at best, if the sphere were spinning, you'd have gravity around the equator, but not at the poles, where material would instead fall into the star, creating a whole mess of other problems); the compressive pressures of the shell would be ludicrously intense; and you'd lose the protection of the sun's heliosphere, thus destroying the solar system outside the sphere and opening it up to all the chaos and destruction of interstellar space. Having said all that, though, it's an awesome bit of theoretical science, worthy of good sci-fi. I complained in the last episode that the writers were starting with plot and then fitting in some science, but here, they clearly started with the science. I love the old-school transporter effects. In "Realm of Fear," it was demonstrated that you are still conscious during transport. Does that mean that Captain Scott was aware of the passage of time while his molecules spun around in the pattern buffer for 75 years? If so, it's amazing he's still able to form complete thoughts and sentences and that his mind hasn't turned to mushy mush. One of the unstated mysteries of this episode is: what happened to the civilization that abandoned the sphere? They were mind-bogglingly advanced and no doubt numbered in the hundreds of trillions (assuming they could fill the interior surface), but this is the only trace left behind? Perhaps this is the forgotten origin of a Q-like species. This is a great episode, a breath of fresh air following the last few less-than-stellar outings. Bringing Scotty aboard as a guest star is brilliant, and giving him a Rip van Winkle narrative to explore how he handles old age is absolutely perfect. 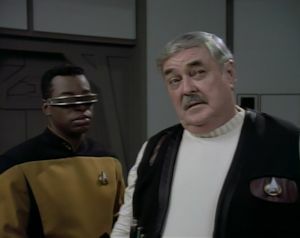 Scotty maintains the connection between TNG and TOS and does his best to give La Forge some more character. The scene between him and Picard on the bridge of the original Enterprise is well-written and touching, and the narrative solution to Scotty's usefulness dilemma makes total sense. The Dyson Sphere is also a cool bit of sci-fi, though it is relegated far into the background and barely explored--probably a wise choice given the wealth of character in this story. This episode was written before Star Trek: Generations, of course, so the fate of Captain Kirk was still up in the air. From a continuity standpoint, Scotty should know that Kirk was lost to the nexus and that there is at least an Enterprise-B, so his line about Kirk bringing the Enterprise out of mothballs to go looking for him doesn't seem to make a lot of sense. However, there are a couple of ways to deal with this contradiction: either Scotty is simply disoriented after being in the transporter for 75 years, or he believed (rightly, as it turns out) that Kirk was still out there somewhere. It's also convenient that Guinan is absent for this one, given that she knows about Kirk and the nexus, having been there herself.